How hackers stole Australia's greatest secrets. "I'm not going to - Andrew, I'm not going to comment on individual cases." The Australian Attorney General says, snapping back at every question. It's a reaction to be expected when the plans for your top secret security headquarters have just been stolen and are sitting on a server in China. "Once you get building plans you can start constructing your own wiring diagrams...seeing how to surreptitiously put devices in." A security expert explains. 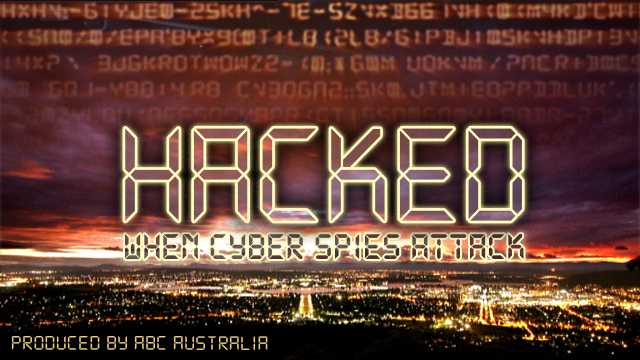 So did the Chinese government mount a brazen hack into Australia's most sensitive secrets? Did they obtain the blue print for a vast new intelligence HQ, making it instantly obsolete? Gary Waters, a government consultant on cyber security for the Australians, explains why they're so reluctant to speak about it. "It's sensitive because if you identify vulnerabilities, then all of a sudden less sophisticated hackers can start to find those weaknesses." But as even he concedes, this line has its drawbacks because if you don't talk about vulnerabilities, "then you can't talk about solutions". It's definitely solutions they should be looking for, as it's not just in intelligence that the cyber war poses a real threat, but also in combat where nations are looking for tactical advantages. "These radios are used mainly for non-tactical operations like counter narcotics control..." Donald McGurk CEO of Codan Ltd, an international arms contractor tells us, but he concedes that it's also frequently used for military purposes. Once the encryption is broken on them the signal is totally open and there's no secrecy on the battlefield, so it wasn't ideal when the plans were stolen and the encryptions reverse engineered. Professor Des Ball believes that these kind of cyber attacks form a key part of China's strategy for national defence, as they build up a cyber team of thousands in the place of conventional forces. "Make those American electronic platforms blind, deaf and dumb. It's the only way that those relatively primitive Chinese capabilities would have any hope against American carrier battle groups." As tensions around cyber security and privacy rise ever higher, the deafening silence surrounding these 'break-ins' is becoming increasingly uncomfortable. Are the first shots in the wars to come now being fired digitally? 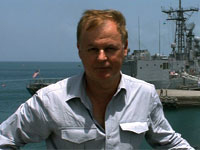 Andrew Fowler has worked for ABC Australia as a foreign correspondent and on the investigative unit for a number of years. Some of his most recent work for the Four Corners team includes, 'Flying Blind', 'Jacob Zuma and the French Connection', and 'A Dirty Business'. He has won the Silver World Medal at the New York International Television and Film Awards in the category of Australian National and International Affairs for his report on Somalia, 'Pirateland'.